We have previously reported about other exciting Rock ‘n’ Roll Fantasy Camps held around the world. For 2014, it’s another stellar line-up including rock band KISS superstar Gene Simmons. Gene Simmons is a both rock legend and media mogul and be the mentor of “The Gene Simmons Rock Camp™.” Simmons will also jam with campers with fellow rock star friends at Rock ‘n’ Roll Fantasy Camp. It’s a great opportunity to meet and play with a legend like Gene Simmons. He is just as big a celebrity today as he was back when playing bass guitar for rock band KISS. In addition to Simmons, the music camp will also feature Tommy Thayer (KISS), Sebastian Bach (Skid Row), Steve Stevens (Billy Idol), and Dave Ellefson (Megadeth). The above music stars will help out camp musicians of all levels to form bands, learn or perfect their knowledge of an instrument, and even write and record a song. It’s an amazing musical experience that should not be missed. The four-day Rock ‘n’ Roll Fantasy Camp which runs between March 27-30, 2014 will climax with a live performance at the House of Blues at the Mandalay Bay Resort and Casino in Las Vegas. 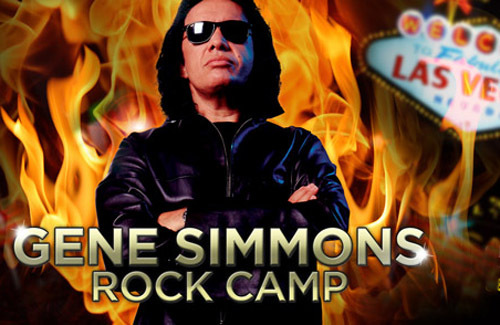 Gene Simmons last took part in a fantasy camp back in October 2012, which was a huge success and very popular with the camp attendees. Space for the 2014 Rock ‘n’ Roll Fantasy Camp is extremely limited, so act fast if you want to jam with Gene Simmons and the others. If you are interested in attending the upcoming Rock ‘n’ Roll Fantasy Camp – “The Gene Simmons Rock Camp,” please contact The Life of Luxury to learn more information.